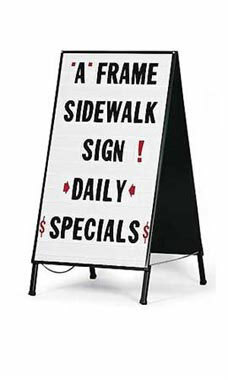 Promote daily specials, deals, and other advertisements with the Changeable-Lettering A-Frame Sign. This sign is ideal for sidewalks or lobbies and has a professional appearance that attracts shoppers. The sign is 41”H x 21”W and has a sturdy metal frame with a black finish. The A-Frame Sidewalk Sign includes 300 4” letters, numbers, and symbols that are sure to stand out to shoppers. One of the lines that held the letters needed superglued, otherwise, great product. Sturdy construction. Not affected by wind, so far. Plenty of letters. Sign is great for sidewalk purposes. I'm using it on side of road so a bit harder to read. All letters are black and numbers are red. Would be nice to have both in each color but not a problem. All lettered are same size. Would be nice to get larger letters if that is an option. Lots of letters and a big sign area. Very sturdy a useful. It's easy to use and really grabs the attention of anyone passing our store. Works great! Sign is very clear and visible from a great distance. Easy to use, easy to read the letters. Comes with an ample amount of letters, numbers and symbols. One of the best purchases I have made for my store! We have already generated more business from our sidewalk sign, it comes with enough letters to change it to read as much as you want it to. It stands strong and we had it out while it was raining and it still held up great. Highly recommend! Sign works great, is heavy and wont blow over in heavy winds. Gave it 4 stars, would be 5 if it had a carry handle on top. One other thing; the letters that came with the sign didn't fit, we had to cut them down and there were no letter G's in the pack.